*Weekly Sector Watch highlights several industry groups that have experienced a measurable change in strength or weakness relative to other groups over the last 3-6 week period. SECTORS EXHIBITING RECENT STRENGTH: Software (Medical), Software (Application) Software (Infrastructure), Internet (Content), Electronics (Misc. Products) Electronics (Wholesale), Electronics (Parts), Medical (Long Term Care), Medical (Managed Care), Medical (Biotech), Medical (Products), Medical (Research Equip/Services) Commercial Services (Healthcare), Leisure (Products), Leisure (Services). SECTORS EXHIBITING RECENT WEAKNESS: Energy (Solar), Energy (Coal), Oil/Gas (Refining/Marketing), Oil/Gas (Drilling), Oil/Gas (Machine/Equip), Oil/Gas(Integrated), Oil/Gas (Field Services), Mining (Metals/Ores), Banks (Super Regional), Steel (Producers), Steel (Specialty Alloys), Transportation (Ship), Transportation (Truck), Financial (Investment Banks/Brokers), Electronic (Semiconductor Fabless). OVERVIEW: Despite the headline news, the major indices have been able to gain over 3% the last two weeks. 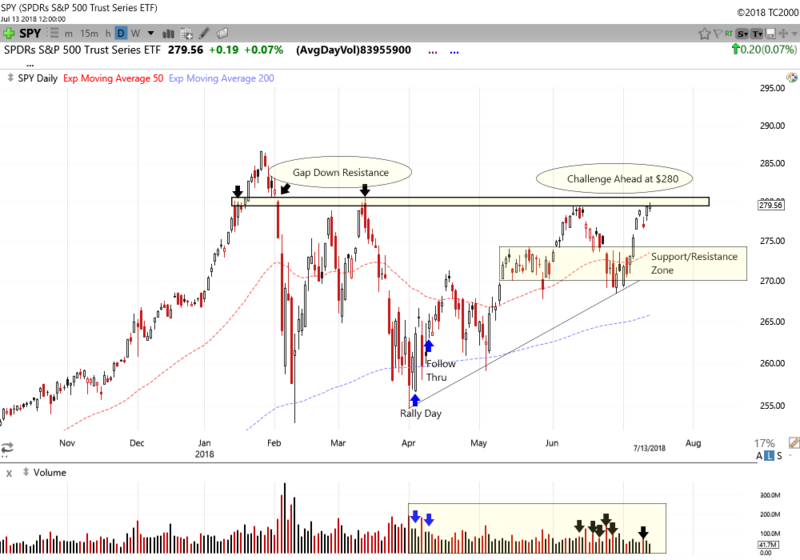 Although still in an uptrend since a confirmed rally back in April, the S&P 500 continues to lag behind tech and small caps and has now approached resistance near the key $280 level. 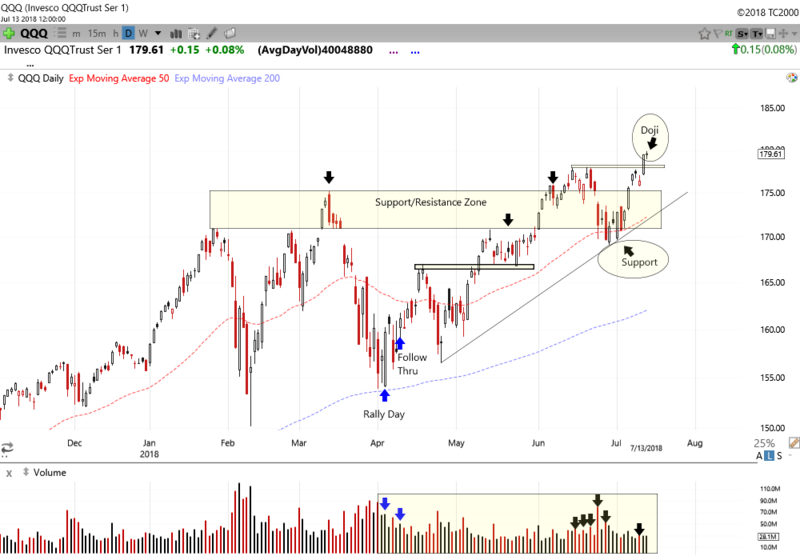 While this area of the market has supplied some tough sledding amidst a sideways chop for most of the year, there have been many areas of strength for traders to focus on. While we must monitor the major indices for signs of distribution that may foreshadow corrections, we must always defer to market leaders and the individual stocks in our portfolio as the true barometer for our trading. In recent weeks we have noted to our clients the series of distribution days that had been taking place within the indices, and despite this, there have been many areas of strength traders could have turned to for returns on the long side. As always, it pays to be flexible and opened minded in our trading so that we can quickly switch gears if necessary. With that, let’s take our weekly look at the major indices we cover here paying particular attention to our Russell 2000 summary at the end of the write up. 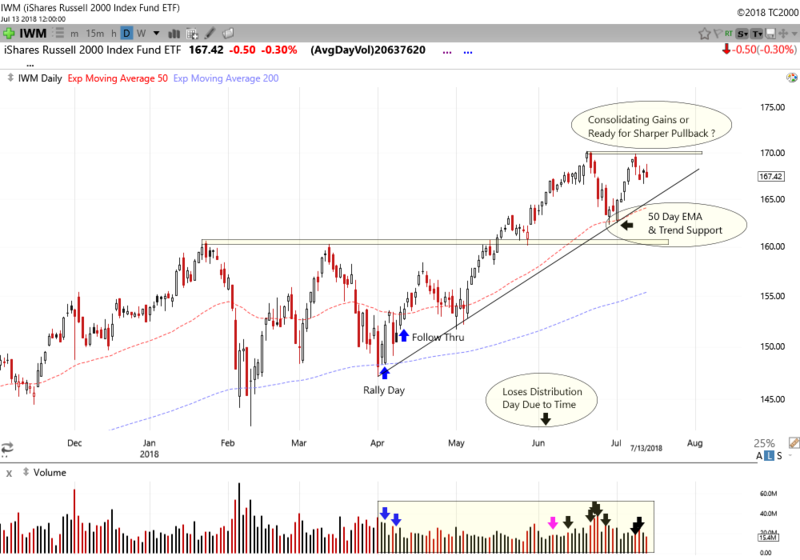 SPY- The ETF that we use here to track the S&P 500 turned in a solid week despite a nasty looking distribution day on Wednesday, and after a rough June that saw a series of distribution days hit the index, the selling has dried up a bit here so far in July. However, the recent push has put the index right up against six month resistance near the $280 level, or 2800 on the index itself. The ETF that we favor here to track the index still shows six days of distribution over the last 25 sessions, but we will lose the 6/13 day off the count mid-week next week due to time. Additionally, if we can rally 1%,or better next week, we can knock a few more days off the count due to a 5% advance from those distribution day lows, so things could clear up nicely for the index if it can push through resistance. NASDAQ- After finding support in late June at trend and moving average, the index has now pushed to new highs. However in doing so, it print a doji candle on Friday. These candles represent a stalemate between supply and demand and suggest that a current uptrend or downtrend may be ready to stall, or reverse. We need only to look back to March of this year (highlighted and circled on the chart) to see an example of this. Now before we get crazy, this does not mean I am calling for a top here. I will go back to what I stated in the open today, that as traders we need to be mindful of what is happening right in front of us. No technical analysis is fool proof, and even if signals such as these candles bear out the suggested outcome, it may be of only temporary influence. So, take your trading one day at a time and continue to be mindful of what is in front of you. 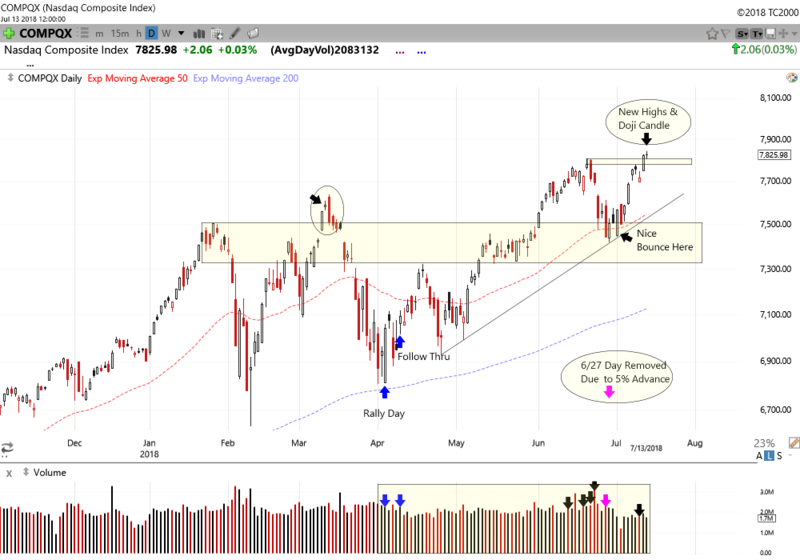 In this case it may mean not chasing a trade early Monday, until we see how this technical pattern gets resolved, and if this saves you from a potential quick loss on a trade, you were served quite well by noting the pattern. From a distribution perspective, we did lose the 6/27 day off the count due to the advance from that days intra day low, so like the SPY, we are looking slightly better in this regard. QQQ- The Nasdaq 100 shows the same pattern as the Composite. Again, perhaps it means nothing, or is of temporary influence, but we must make note of it and not ignore its existence. The index sports six distribution days in the current count but has been much better behaved since late June. Look for any pullback to find possible support at the top of prior resistance near $175, the 50 day EMA, or the current three month uptrend. 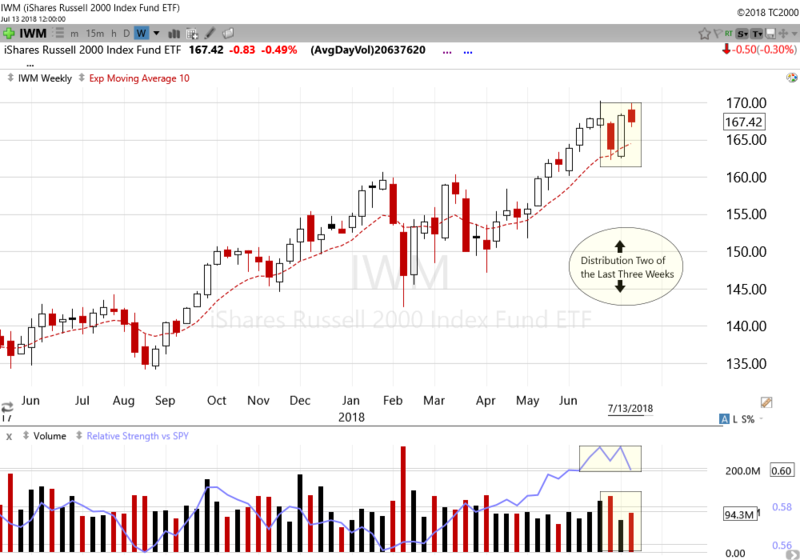 IWM- The small cap Russell 2000, which had been leading the markets advance, slowed a bit this week as the index suffered back to back distribution days, and now sports seven in the current 25 session count. We are going to take a look at both the daily and weekly charts today to gain a bit more perspective of the current state of the index. Below our daily view clearly shows a change in character from a calm May accumulation standpoint to a cluster of very heavy selling days in June, along with the back to back days more recently here in early July. The second chart, a weekly view, shows two distinct distribution weeks out of the last three. We also note the downturn in Relative Strength. Perhaps a rotation out of the small cap arena into the some of the lagging larger caps names is in progress, or perhaps this is an early sign of something more serious brewing under the surface. Again, we don’t predict here, we just prepare based on the facts in front of us. For more in depth coverage of the markets, along with real-time stock and option trading alerts, join myself as well as veteran trader Greg Krupinski of GK Trading at http://www.ttptrading.com where you get access to all our real-time trading alerts and trading material for only $69 per month. See you there!